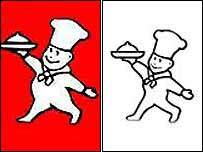 The trademark tubby cook who has been the logo at restaurant chain Little Chef since 1972 is being put on a diet. Now the rotund chef is being sent to the health farm, as part of a new look to the chain, which is cutting down on salt and adding fruit to its menus. "It is the start of a re-image programme for Little Chef," said chief executive Tim Scoble. Little Chef has come up with a slimmer version of the chef as part of a general sprucing-up operation to improve its image. "It (Little Chef) has not been developed to its full potential over the last 10 years - perhaps it has become a little bit dated, and we now want to take it forward into the 21st century," said Mr Scoble. He added: "We have had a lot of customer feedback about the Little Chef's tummy. "A lot of people have also written in to say they assumed it was a small child carrying hot food." He said there was generally growing concern within the catering industry about healthy eating, and the amount of salt and sugar in food. "We are looking at that, and trying to reduce salt levels." New food includes meals with less salt and sugar, and more fruit and muesli options. Mr Scoble said the company would be keeping the All Day Breakfast as its "champion product", which he insisted was healthy. He said the sleek new chef would be re-examined in a few years time to see if he should remain as part of the company's branding.